Greetings from Nairobi! We returned on August 20 after several months in the states. We apologize for not getting out a July newsletter, but it was difficult to keep up with correspondence with all the traveling. Our remaining activities in the states went very well. Our uplifting visit to Redeemer in Ft. Collins CO was followed by a few days with Claude’s sister Alice and her husband Harold in Canon City, where Harold is an LCMS pastor. We enjoyed the scenery and some fun times with our lovable great-nephew Jack! It was great to spend a Sunday at dynamic Good Shepherd Lutheran Church in Owatana MN in early August. 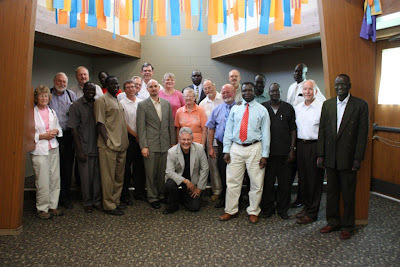 Also, we were able to get one more visit scheduled in Omaha NE to meet with the leaders of churches and organizations working with Sudanese ministry in Nebraska and Iowa. Claude wanted to introduce Rev. Jacob Gillard (on home leave from Uganda) to these men since Jake will be working more closely with Sudan in the future.  Praise God for safe travels while in the US and back to Nairobi.  Pray for us as we continue our work here. There is so much to do with projects, reports, and communication with partner churches, preparing for visitors, and many other activities that seem far from what we think of as “traditional” mission work. But all is part of sharing the Gospel of Jesus Christ.  We thank God for those of you who pray for us and support us. We don’t correspond directly as often as we would hope to, but we are grateful for your partnership with us in our mission work.